For many years I have studied firearms. Though I have always favored civilians being able to own and use guns for self-defense, I have worked to be a participant debating the issue, listening and learning the perspectives other Americans hold and the reasons they believe their points of view. Firearms have been in my life always and have been beneficial tools and not tragic instruments. I live in a rural community where firearms are prevalent, and from the news of my state, I know Oregon loses 138 people to gun homicides each year based on 2014/2015 CDC statistics. This is a lot of folks, but comparatively I understand we have many challenges to life with 506 Oregonians dying from drug overdose, 501 from auto accident, and 760 from suicide which includes 475 suicides where a gun is the instrument. We have many challenges and we need to investigate root causes for each. Practice improves skills which is key to firearm use. 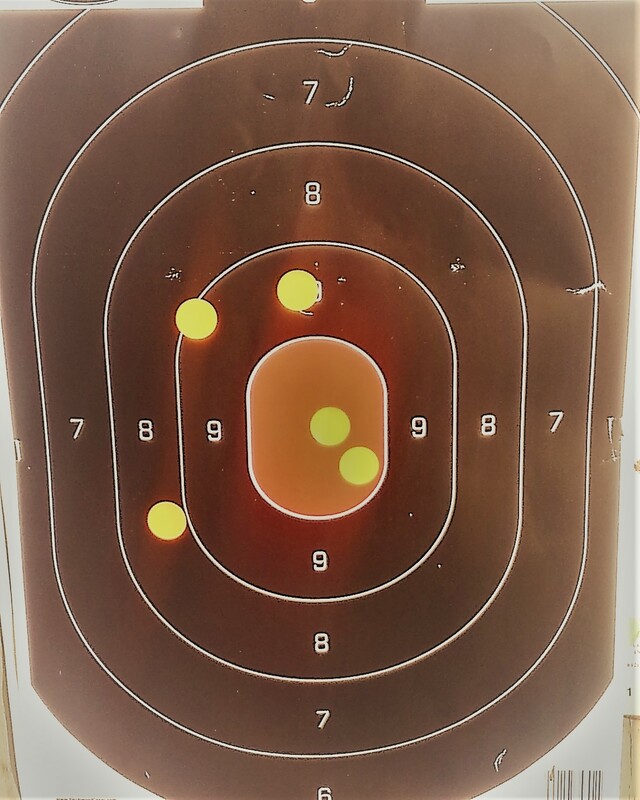 Target was at 25 yards and the firearm used was a .38 S&W. A sharp knock suddenly came from the front door. It was early evening. The knocking was a surprise, or at least uncommon at an older farmhouse situated in a cotton field a quarter mile from the closest neighbor. Only Mom and I were at home. Mom opened the door. She saw two men. They told her they wanted to sell her a magazine subscription. They were forward, persistent, even threatening. I could see she was concerned, maybe with the same vulnerability and helplessness I felt. Only a thin screen separated her from the strangers, and she had no way to protect herself and her son. I slipped into my parent’s bedroom and recovered a .25 caliber Mauser pistol from the safe, returning quickly to stand watch as a good soldier. At least we were not helpless. Mom paid for a magazine order, and the men left into the evening. The magazine didn’t arrive over the next month, but the publisher made good although the order was not submitted. Most of all, with a little help from the Mauser we could defend ourselves. Wednesday evening a while back, I watched the CNN forum on the Parkland School Shooting. Repeatedly, parents and students demanded that their schools be safe. Their slogan: “never again.” They should not have to feel they are not safe. For some of the students, the elixir is to prohibit the sale of “military assault” weapons, such as the AR-15. I empathize with the students; they deserve to feel safe. I believe some programs will improve safety generally, without broadly denying individuals access to firearms for self-protection. This guarantee is particularly American. The most common measure suggested to improve safety is background checks. Interestingly, this measure, supported by more than 90% of Americans has failed in the past. The difficulty is background checks didn’t disclose the assassin at Mother Emanuel AME when a police disqualifying record regarding drugs was not found. At Sutherland, Texas it failed because the Air Force did not report disqualifying spousal abuse; and now at Parkland warning signs to the FBI and local law enforcement had not been followed or documented. Also, the Orlando shooter was under scrutiny by law enforcement but law enforcement was not able to intervene. My primary concern is that adequate measures for firearm safety should be tested and proven, and every effort must be made to refine the system including background checks to assure they work. We cannot compromise the guarantee of due process. Ultimately this may authorize a process for prequalification, so law enforcement is not always in a reactive stance that so often fails. What is most frustrating is the debate always appears to careen into a bumper-car-style-contest losing the juices of collaboration for problem-solving. Instead, the sides of the debate appear in the past to talk past each other. The result is impasse and deadly dysfunction. Looking online for a statement of current gun control proposals that may represent the perspective of many students, I found in Vox, an essay “I’ve covered gun violence for years. The solutions aren’t a big mystery.” German Lopez wrote the article and it published on February 21, 2018. This statement may well become the manifesto for the gun control movement. Fortunately, to better understand this movement, German Lopez has provided 5 clarifying propositions. Let’s review them one-by-one. The article relies upon an analysis comparing the United States to what they have determined to be “way more gun deaths than other developed nations, and it has far more guns than any other country in the world.” The analysis looks at only the United States in aggregate and the information derived from the Guardian newspaper as compiled from United Nations’ sources. The chart below demonstrates the critical features relating to firearms in America. The primary finding is the tremendous variation among the states regarding “gun murders”. They range from .6 per 100,000 to 9.5 per 100,000. The former is similar to Canada, Luxembourg, Belgium, Italy Switzerland, and Macedonia while the latter is at Mexico and Philippine levels. The difference does not appear to be state legislation favored by gun control organizations, because both the highest rates and the lowest rates receive low grades of D+ and F from the Legal Center to Prevent Gun Violence. We should determine what separates New Hampshire and Maine from Missouri and Louisiana and “bottle it”. There are significant clues, and we need to look to our laboratory of states for an answer. There are areas in America where there is a significant problem with “gun murder”, but other states do not have this problem, and these states should provide lessons to all of us. The chart above also compares the factors of murder, gun murders, and gun deaths. Often gun control literature uses the measure of “gun deaths.” This category combines firearm deaths from all causes and not just homicides. The “gun death” category may advance a false impression that specific states with relatively low “gun murder” rates have high overall gun violence. This is achieved by combining murders with suicides. Both are tragic, but they are very different phenomena. It is misleading to combine them into a single measure without significant explanation. It is not useful in establishing policies to address “gun murders” throughout our country based on the American experience. The chart below defines relationships among the various states. The left column tells the proportion of “gun murders” to “gun deaths”. 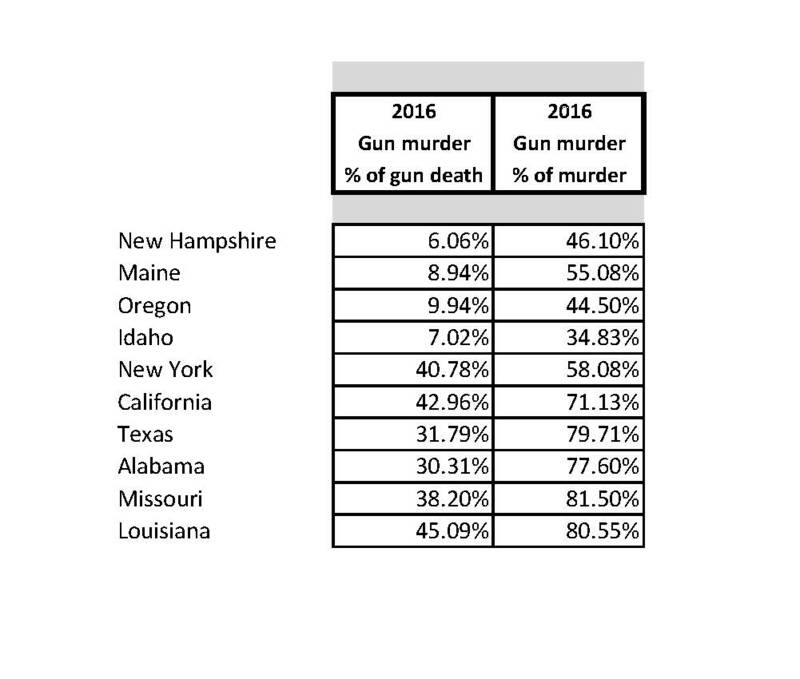 As we indicated above, “gun deaths” include mostly suicides by gun combined with “gun murders.” The right column defines for the states listed the percent of murders which are “gun murders”. The graph uses 2016 data. We see variation relative to both the relationship of “gun murders” to “gun deaths” and murders themselves. At the top of the chart where gun murder rates are relatively low, a substantial proportion of “gun deaths” are a result of other factors, particularly suicide. Likewise, in the same states, guns are the instrument of murder in a smaller proportion of the instances. The relationships are very different in Alabama, Missouri, and Louisiana, where most murders are by gun and gun deaths are in the range of 60% suicide and 40% murder, not 90% suicide and 10% gun murder as is the case in New Hampshire, Maine, Oregon and Idaho. The conclusion is that we need to review what is happening in the United States and understand the variation among the states. We must do this instead of rushing to broad, likely misleading conclusions. American states with higher “gun deaths” may not have a “gun murder problem”, but instead a suicide problem. Overall, guns are the instrument for about 50% of the suicides in the United States, but this varies by state. The problem is neither guns nor mental health – it is instead the failure of communities to manage firearm related issues. The thrust of the Second Amendment is about communities, but most of the actions on firearm issues are in places far away — state capitols and Washington, DC. Achieving effective firearm safety requires active communities and proactive local firearm policies. The charts I have provided demonstrate in the United States there is tremendous variation in the number of “gun murders” between states. Extending the analysis to communities will, I believe, show increased variation. There is an increasing consensus in the United States to remove from owning firearms people posing a clear and present danger. The conservative publication National Review has addressed this through gun violence restraining orders which they find potentially a useful tool to prevent violence. It must be narrowly framed and include due process guarantees. 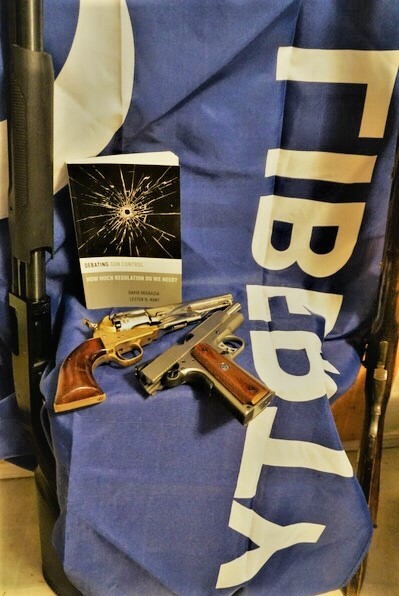 Looking for a case study where duty, traditions and a regulatory backdrop, Switzerland has done a commendable job building public support for legal gun ownership and keeping their communities safe. Their approach is the contrast to the general gun confiscation regime adopted by Australia. Looking to Switzerland, we find a country that has general gun freedom. A couple of factors appear to separate it from the United States. There is a tradition for gun use derived from family, community, and military service. Also, police vetting of potential malefactors appears much more stringent. Switzerland does not have gun murder rates as low as Great Britain, but overall it is quite safe. According to the United Nation’s information its factor is .77 per 100,000 which is similar to Turkey, Italy and Belgium and less than Liechtenstein at 2.82. An article in The Atlantic describes the Swiss case study. My investigation discloses there are three primary frames when understanding guns in America. (1) The first is a free market frame, based on the marketplace. The free market is mostly the frame of the National Rifle Association and the Republican Party. Its principal goal is freedom and focuses on the supply-side in economic terms. (2) A second is a regulatory frame, based on rules, and a police entity (often a federal entity) enforcing the rules. Regulation is the frame of gun control advocates and now the Democratic Party. Its principal goals are safety and control, generally through federal and state government Laws and rules. (3) I believe there is a third frame, based upon community service. It allows general access to an activity found to have a substantial public benefit and acceptable to a local community. It is not the same as a marketplace. Instead, the third frame is best implemented through local institutions and community interaction. I believe, the language in the Bill of Rights about a “well-regulated militia” speaks to this frame. With the service frame, gun ownership and use can become an operational risk management problem applied to a local community that achieves an efficacious solution. The benefit of the activity is established, and the risk is defined, often locally with state and federal support. Specific mitigation measures are elaborated to reduce risk to a reasonable level. In the context of the Second Amendment guarantee, this approach offers the best balance for the constitutional safeguard against the danger it poses. The service approach also offers a greater opportunity for practical, proactive actions. For example, regarding firearms, every police agency and especially sheriff departments should have a firearms bureau or officer. Its purpose would not be solely intradepartmental such as training officers but also supporting the community. Certain firearm purchases could be vetted through the firearms officer and would be accurate than just a background check. Also, the community firearms officer would work with local firearm clubs and ranges to assure effective firearms safety training. All of this would go miles to ensure a firearms community that would be safer for shooters and the general community. Why is the service frame not a regulatory approach? The regulatory approach allows a guarantee to be eroded one-bite-at-a-time based upon political compromises often in more distant state capitols and the federal legislature. They are susceptible to fixes or workarounds which are temporary accommodations which are often not transparent and not resilient as a Constitutional right must be. The regulatory frame largely ignores communities where solutions rest. German Lopez uses the example of Australia to make his case for gun control working. He points out that in 1996, a 28-year-old man killed 35 people and wounded 25 more in Tasmania. The Australian authorities in response enacted a measure resulting in a gun confiscation. “Hemenway and Vriniotis in 2011: ‘while 13-gun massacres (the killing of 4 or more people at one time) occurred in Australia in the 18 years before the (Australia gun control law), resulting in more than one hundred deaths, in the 14 following years (and up to the present), there were no gun massacres'”. Other studies have been conducted subsequent to 2010, and the results are mixed. The conclusion remains there is no consensus which defines a clear and profound conclusion. NFA proponents say that at least there has not been any mass shootings in Australia since 1996. Definitions are central in this analysis. The strict definition is Four or more shot and/or killed in a single event (incident), at the same general time and location, not including the shooter. By this criteria, the Monash University shooting in 2002 constituted a mass shooting with 2 killed and 5 wounded, as did the Hunt family murders where 5 (including the shooter) were shot and killed. Also, the Australian “Massacre” page in Wikipedia defines that through various means there have been nine mass killings with 56 deaths by multiple methods since the 1996 Tasmanian massacre. None of these rose to the single major event of the Port Arthur 1996 massacre in Tasmania where 35 people were killed and 23 wounded. This profound tragedy led in Australia directly to the enactment of the NFA. The bottom line with this is the Australian political situation. The country does not have a Second Amendment and its related history. The cultural development of Australia has been very different than the United States. Essential Research in a poll conducted in January 2016 found only 6% of their public thought the NFA was “too strong”, 44% felt it was “not strong enough”, and 45% “about right”. Whether or not “gun control works” the Australian public feels safer, so the agreement continues. The public by large margins in Australian has determined that the NFA serves their safety. Australian commentators are quick to recognize this, but also they also often relate the great differences between the American and Australian historical experiences. The wholesale transfer of the NFA to America may have very different results. Likely we will not achieve the consensus of Australia and ultimately safety will not be served. Americans may own guns for self-defense. Australians do not own guns for self-defense because the applicant must give a “genuine reason” and self-defense is not on the list. In Australia guns are available to farmers for protection against animals and for hunting and target shooting. In America, firearms may be used for the protection of self and family. This distinction is a critical difference between the American and Australian experience. Though there is not a consensus about what the statistics mean regarding the National Firearms Agreement, an important contrast remains regarding whether firearms may be used for personal protection. To address more directly whether gun control works, we should look at the experience among the various states. Though the Australian National Firearms Agreement provides a case study on what gun control has done in another country, the most pertinent experience is America’s. I had read much on the subject, but much of what I read appeared dubious, especially those that use the category “gun deaths”. Therefore, I did my own comparisons using my Excel spreadsheet. I gathered the numbers online obtaining the gun murders in each state using the rate per 100,000. To determine which states had from a proponents perspective, the best measures, I relied upon the Law Center for the Prevention of Gun Violence. They provide their judgment about the strength of each state’s gun laws. I used the Excel correlation function to determine the relationship. Performing this correlation in years past I a negative correlation between states ranked by gun murder rates and grades on effective gun legislation. My most recent comparison using 2016 data, disclosed a relationship of .15 between state gun control legislation and the rate of “gun murder”. This correlation is a weak relationship and does not justify a statement that “gun control works.” On the other hand, if the relationship is between legislation and “gun deaths” the relationship is more robust at .70. This stronger relationship is achieved because the standard of “gun deaths” combines murders and suicides. The relationship between gun laws and suicides is .77. This is much stronger that the .15 for “gun murders” and gun laws. German Lopez recounts his impression that gun murders are high in Chicago because guns are easy to purchase in Indiana. His conclusion is not compelling because effective interstate efforts should be developed to prevent an infusion of firearms. If we cannot curtail interstate gun traffic now, how will broader gun prohibitions he recommends be enforced? Many (but not all big cities) have increasing rates of gun murder. These higher rates are not universal. Some big cities are up, while others are not. A short article in YES magazine establishes that three states, using very different approaches, have influenced gun homicides. The report does not conclude as to why, but it offers a question worthy of further study in the laboratory of American states. According to Yes, various California, New York, and Texas large cities are very successful in reducing gun homicides. California and New York are very regulatory in their approach, while Texas has expanded gun rights. In a general sense, the tables provided earlier in this article make the same point. America is not uniformly a nation of gun violence. Instead, many states using different approaches have been successful at keeping gun murders down. Given the Law Center for the Prevention of Gun Violence failing grades for very successful states, something else must be going on beyond or instead of gun control legislation. This success should be a primary subject for investigation and action. Going further with gun control than anyone wants to admit is central to this essay. Many Americans see little value in gun ownership. They do not live in a rural area where guns are a traditional aspect of the culture. We are told fewer folks are hunting, and the primary reasons for firearm ownership and use outside the more rural communities are self-protection and skill development at the gun range. Many in “polite society” are repulsed by guns as unforgiving cold steel. I believe that without the National Rifle Association firearms would have been outlawed and highly regulated in America as they have been in Australia. The gun rights victory preventing this was the Supreme Court decision in the Heller case documenting a right to own firearms. Though many Americans support the Heller decision, other see it as anathema to progressive American values. In fact, It is a common complaint by significant political actors including Presidential candidate Hillary Clinton that Heller was incorrectly decided. The Democratic party has moved in its 2016 platform from mild support for Second Amendment gun rights in 2012 to a dedicated campaign against gun violence and by implication, Second Amendment guarantees as interpreted in Heller. I am a member of the NRA. I believe in some circumstances in my life firearms have contributed to my safety. I do understand the desire for safety is essential and universal. Abraham Maslow establishes it in his “hierarchy of need” as primary, just above the physiological needs of food and water. Others may see their family’s safety differently, and I need to respect their perspectives and hope they will respect mine. For my circumstances in a rural place with law enforcement potentially not close at hand, having the capacity to defend myself from man and beast is essential. I believe most folks in my area agree and I only wish there was an increasing development of community approaches to secure safety from criminal activity. These must include work with community institutions. The NRA’s role is a primary participant working towards a developing consensus. They should not just be protecting the ramparts of liberty, but also reaching out to a public engagement including diehard adversaries of Second Amendment rights. This consensus must include personal and family defense with firearms in addition to firearm sports and hunting, but it must be broader and establish templates for community-based safety initiatives that will include the responsible use of firearms. The profile for using guns can be improved based on a service framework. The NRA developed its program of marksmanship and firearms safety on a “scientific basis” beginning in 1871. It is a logical step to advance programs with or without Federal legislative support by model local legislation through County sheriff departments. Program elements should include vetting purchasers, potentially issuing screening cards combined with concealed carry permits, providing training and qualification. Federal and state support enabling this effort will facilitate its success, but it will take a different perspective with a greater awareness of communities and their needs. As this becomes standard, nation-wide success addressing violence should be more pro-active. 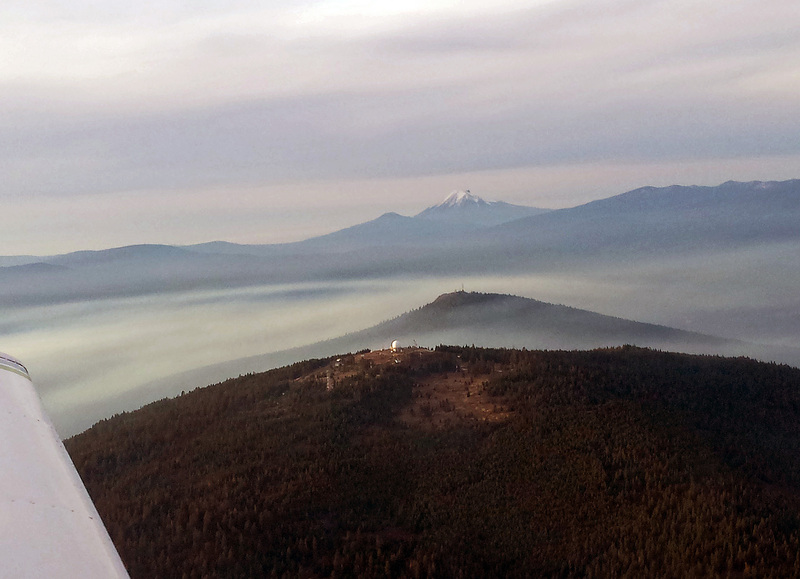 I would suggest looking at how the FAA certificates pilots for some insights pro and con. It involves training and a continuing educational involvement with the skill of pilotage. Each pilot either completes an educational program every two years or takes a test, called a bi-annual. A set of cadre called Certificated Flight Instructors (CFI) has developed who are the foundation of flight safety and proficiency. It would be an easy reach because the NRA has already established a strong corps of firearm instructors and they could support a community-based effort through police and sheriff departments. This type of rigor with firearms ownership and use will further build a constituency based on proficiency and will also enhance the quality of safety for the general public without adding a stifling and overarching regimen of dense regulation offering sparse protection. My concern is that unless an approach to firearm use in America is established using the service framework including operational, federal and state leadership, risk management and local action agents, we will further divide as a people. Blue states such as my home Oregon will add each year to their requirements and will disqualify more people from firearms ownership and use although their gun murder rates are low. Currently, the polls are changing, moving against firearms rights and in favor of gun control. This change may accelerate, or it may vary depending on what happens in legislatures throughout the country. In time, likely there will be a Democratic President and Congress and draconian measures they have advocated may well be passed including Australian style gun control. We must look to history to understand what the impact may be on American culture. It is challenging to imagine where a gun prohibition approach may lead. The tragedy at Ruby Ridge not too many years ago is instructive as is the action of the FBI agent with the killing of Robert La”Voy” Finicum in 2016. In at least these cases federal agents from a distant government demonstrated “dirty hands.” We must acknowledge and address this as we engage one another to resolve what we should all regard as a crisis. I am very concerned I hear no prominent Democrat calling for balance and specific measures based on American successes to address risks. Instead, I see them looking to legal regimes far away in Australia, Great Britain, even Japan, for the models to address their needs instead the success of American states have enjoyed. My purpose is not to chastise Democrats but instead to ask them to broaden their perspective, working for service-based solutions instead of continually advancing a set of pre-defined measures proven ineffective in many cases or programs plagiarized from countries far away. We need to involve the states, and indeed the Republicans and the National Rifle Association are far from blameless and must put their red meat in the freezer and grow some trust and initiative to engage their fellow Americans in breaking the gun policy impasse that serves no American of good will. In 1967 when I was 19 years old, my father allowed me to use three horses to take a friend to Parole Cabin Meadow near California’s Little Kern River. After a long ride, my friend and I set up camp. We had three horses, two for riding and one for packing. We staked two horses and belled another that roamed around the meadow. After dinner, we settled down in our sleeping bags. As the night passed, we heard a scream that we thought to be a mountain lion. The horses started to move around, apparently becoming increasingly “spooked”. The belled horse ran across the meadow and up the mountain on the other side, some distance away. It was terrifying to descend into the night in search of the horse given the screams we had heard. I arose, put on my pistol and walked across the meadow and up the hill. After some searching, I found Happy, the belled horse. He was shaking. I took him down the mountain and across the meadow to camp. I tied him, and things settled down. I took off the pistol which had empowered my effort and went to bed. With a little support from my Ruger, we felt safe. This experience may be out of life context for many. All of us, however, have our own profound life experiences and they build our perspectives. Each is personal and valid though situational. All policy effort requires us to consider others and respect their point of view to find a useful conclusion. Beneficial conclusions are challenging to find using broad measures. Typically communities using powerful tools such as risk management processes and the outreach of local leadership and management empowered through adaptable state and federal initiatives can provide the more useful tailored results to achieve gun safety.